The alleged test results of the Sibiu water supplies do not appear to have received national-level coverage in Romania at the time or later (I can’t vouch completely for local Sibiu publications). There was no follow-up. The foreign doctor involved in reporting to the rest of the world the test results has had a spotty record for getting things right since December 1989. Moreover, it would not be the first time that a well-mediated international event has attracted media gadflies, seeking their moment in the media spotlight. 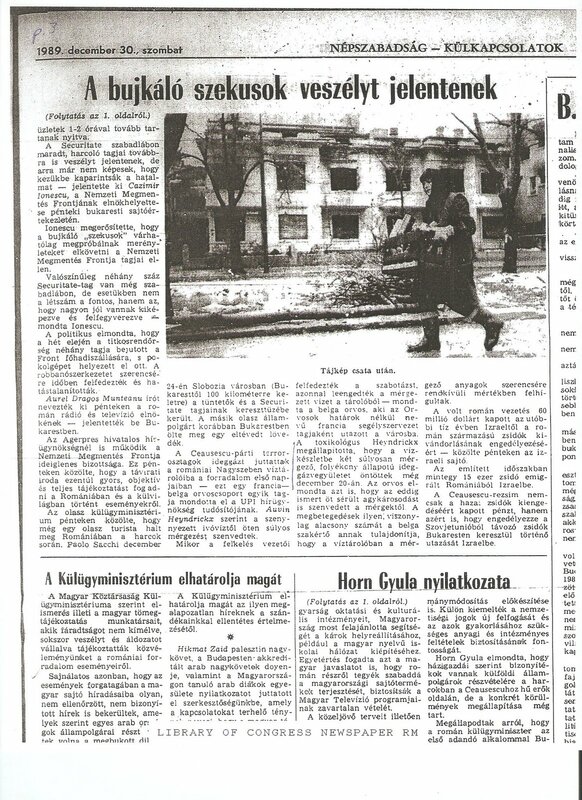 All this said, it remains significant precisely because the claim was about one city alone; it wasn’t just any city but Nicu Ceausescu’s fiefdom; the allegation about people turning up sick at the hospital and of the timing of the alleged dumping of the toxin in the water supply dates from before (20-21 December 1989) the Ceausescus took flight on 22 December 1989; the foreign doctor gave details on the testing, argued that the toxin was diluted, and does not seem to have engaged in trying to blow the episode out of proportion. Anyway, below, some of my extensive earlier research on trying to track down the veracity of these reports. Yes, dear friends, according to a toxicology report filed in late December 1989 by Belgian toxicologist Dr. Aubin Heyndrickx, the water in Sibiu had indeed been poisoned. Romanians, Romanianists, and foreigners who assure their audiences without a shred of self-doubt that there was no basis, no reason for Romanian Television, and specifically television presenter Teodor Brates, to panic the population with claims that the “water in Sibiu has been poisoned” are simply: wrong! Does this mean Dr. Heyndrickx’s claims and findings were necessarily right? No. Were his tests tainted or interpretation of them colored by the collective state of mind that prevailed in Romania and abroad about Romania in late 1989? I don’t know. As with so many other things, the Romanian military procuracy apparently never sought to follow-up on Heyndrickx’s toxicology report, or, if they did, they long since buried it. What is clear is that Dr. Heyndrickx’s test results mean that there was an understandable basis for suspicion that the water in Sibiu had been poisoned and that those who continue to treat the poison water in Sibiu rumor as obviously false and obviously baseless do public understanding inside and outside Romania a tremendous disservice. On December 21, 1989, people drinking from water tank #4 in Sibiu experienced headache, visual disturbances, loss of consciousness, vomiting, etc. These symptoms are all compatible with organophosphate poisoning. The analysis of the water (by gas chromatography) and the determination of the cholinesterase activity of the blood was done in the University of Cluj. The conclusion was that an organophosphate had been used. Atropine sulfate and toxogonin were advised. As soon as the symptoms appeared among the population, water tank #4 was shut off, rinsed, and cleaned. The people received water from army trucks. Toxicologist Aubin Heyndrickx supervised the chemical tests and interviewed the physicians at Central Hospital who treated the patients. From the tests and from the very high dose of atropine required to produce a response, he concluded that the tank was poisoned with sarin or VX (Report on the Humanitarian Mission to Romania, December 23-29, 1989, Laboratoria voor Toxicologie Criminalistiek, State University of Ghent). NADLAC, Romania — A member of a French medical team said Friday that doctors determined nerve gas was dumped into a Romanian town’s water supply during the anti-Ceausescu revolt, and five people were seriously poisoned before the substance diluted. Once uprising leaders discovered the apparent sabotage in the municipal water tank in Sibiu, they drained the contaminated supply, said Auvin Heyndrickx, a Belgian doctor who treated some of the victims. 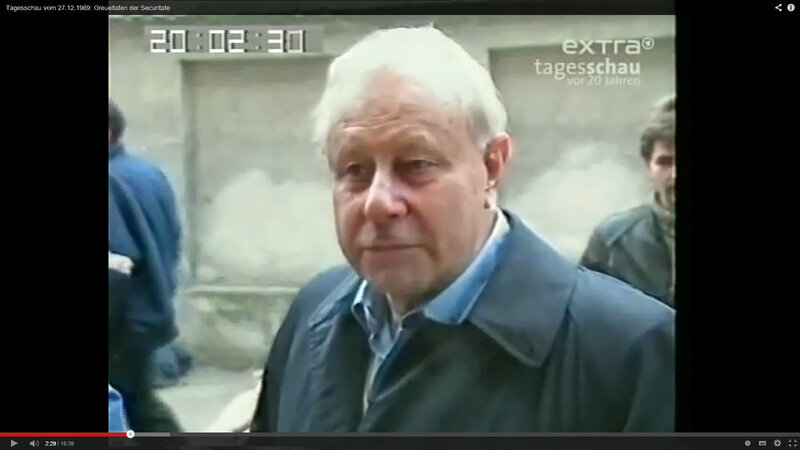 Heyndrickx said he went to Sibiu with a team of doctors from the French relief group ‘Doctors Without Borders’ upon hearing unconfirmed reports of the poisoning, which townspeople attributed to dictator Nicolae Ceausescu’s hated Securitate police force. Set in the Transylvanian mountains of western Romania with a population of more than half a million, Sibiu was lorded over by Nicu Ceausescu, who was nabbed by citizens last week and remained under arrest by the new government. The government executed his father and mother, Elena, Monday on charges of ‘genocide’ and other crimes. Heyndrickx, a professor of toxicology at the University of Ghent, Belgium, spoke with United Press International as his team passed through the town of Nadlac near the Hungarian border on their way back to France. The French team determined that two highly toxic nerve gases, known as sarin and VX, were dumped in liquid form into Sibiu’s water on Dec. 20. Iraq, Libya and possibly Romania are the main producers of the poisons, Heyndrickx said. Heyndrickx attributed the relatively low number of injuries to the low concentration of the poisons in the water. ‘The quantity was very diluted,’ he said. He held out hope that the brain damage suffered by the five victims would not be severe, but said the success of their recovery would remain unclear for days. City workers drained and inspected the water tower before beginning the lengthy refilling process, he said. Heyndrickx said first aid supplies from around the world had arrived in ample quantities in Sibiu and other towns in western Romania, but said long-term medical supplies and equipment are in critically short supply. Baby formula and infant foods are desperately needed in Sibiu, as are antibiotics, anesthetics, surgical gloves and other supplies. Foodstuffs have been in short supply in Romania despite strict rationing, which was halted this week by the new government. Also in one of its first acts, the ruling National Salvation Front government Wednesday abolished a Ceausescu-imposed nutrition scheme that used pseudo-scientific methods to justify harmfully low daily calorie intake levels. I have found evidence of discussion of Heyndrickx and his toxicology report in the Hungarian press of the time, but significantly, to date, I have been unable to find discussion of it in the Romanian press! Nepszabadsag, 30 December 1989, p. 3 citing a UPI dispatch, apparently P. Green, “French team confirms poison in water supply,” UPI, 29 December 1989.
http://www.rsis.edu.sg/cens/publications/reports/RSIS_Food%20Defence_170209.pdf See citations in fn#59 page 10.